To me she is Zsuzsi (nickname for Zsuzsanna, her original name in Hungarian), the eldest of my loving sisters. She is a chess grandmaster and a true ambassador for chess. There are countless things she does to make our game even more popular, such as making chess a part of educational systems and giving the royal game the respect it deserves. Below, see some impressive facts taken from Susan's official website. For much more information, please visit her official website and blog for updates. Susan is also a great chess author as I personally like teaching from her books. 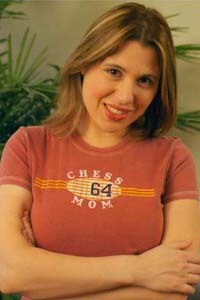 Grandmaster Susan Polgar, the first woman in history to break the gender barrier by qualifying for the 1986 "Men's" World Championship and earning the Grandmaster title in 1991. She became the #1 ranked woman player in the world at the age of 15 and remained in the top 3 for nearly 23 straight years. Susan went on to win ten Olympic medals (5 Gold, 4 Silver and 1 Bronze) and four Women’s World Championships. Her most recent Olympic spotlight moment took place in October 2004, when she and the U.S. women’s national team brought home the first ever medal (silver) for the United States at the 36th Chess Olympiad. In that Olympic, she further distinguished herself by bringing home 2 additional gold medals (one for best overall performance and one for the most points scored in the entire Women's Olympiad). She also got another silver medal for racking up the second-best percentage on the top board. Won the Budapest Championship for Girls under 11 at age of 4 with the perfect score of 10-0! View clip of Susan giving commencement speech in front of 25,000 at Texas Tech!